How do you conduct analysis for a market that is in "No Man's Land", i.e. in an area where there are no S/R levels. I'm looking at the NQ right now and it's trading above it's recent historical levels, so there are no S/R lines to use as reference. 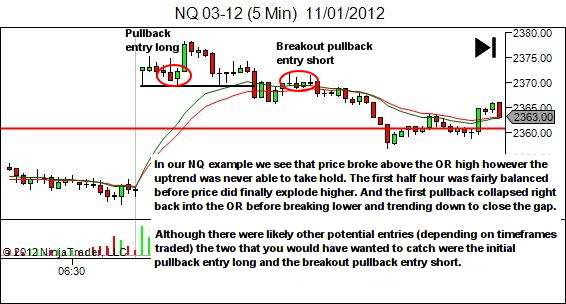 Before answering, let's first have a look at NQ at the open of this particular session. I've displayed a 30 minute chart so that we can see where it's opening with reference to the last couple of sessions. For those who have not heard the term "no man's land" before, it is used in reference to a situation where price is above the previous highest resistance level. Ideally this will be at new all-time highs. But you will often hear the term used when price is just reaching levels that have not been achieved for a significant period of time. 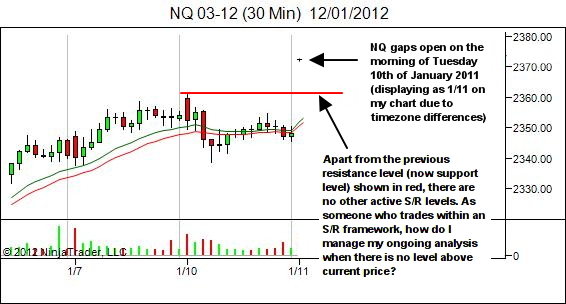 In this discussion I'll talk about "no man's land" in general, as well as discuss today's NQ chart as an example. First, unless we are at an all time high there will be some historical information somewhere in the data. The question though is how far do back we want to go in identifying our S/R levels. There are of course not fixed "right or wrong" rules here. Generally, I'll only go back a couple of sessions; certainly no more than about a week. Note though, I am currently trading the YTC Scalper timeframes (< 1-min). For the YTC Price Action Trader timeframes I would say this would be no more than 2-3 weeks maximum. But the more recent the data is, the better. The key thing here is that they must be levels that are obvious and ideally are levels which recall pain in the memory of other traders. It's pointless going back six months to find a level when I trade 1-min charts, unless that level is a significant market feature such as the 2007 market highs, 2009 market lows, or a key level such as 10,000 in the Dow. So, given the scenario where there are no obvious levels on the normal higher timeframe chart, I may have a quick look at the daily to see if there is anything of major concern further back. 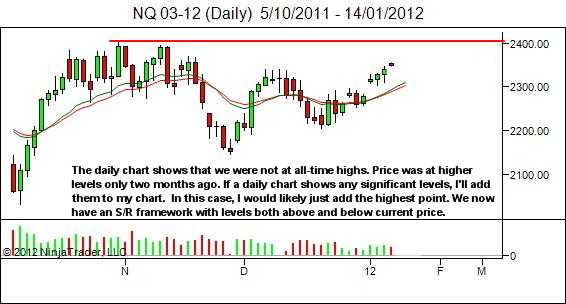 Let's now look at our NQ daily chart. You'll see that in this case we do now have an S/R framework with support below and resistance above price; accepting that resistance is quite a distance away and will require a strong gap-and-go trend day to reach it. 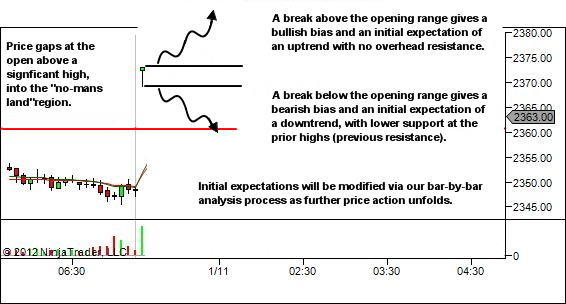 Given that we now have an S/R framework, our analysis is exactly as per the principles for future trend direction as explained in the YTC Price Action Trader. For the remainder of the discussion though, let's assume there aren't any levels I want to add from the daily chart… they either exist too many years ago, or price is at all-time highs. There are two ways price can reach "no man's land". First, it can arrive there intra-session through a break of resistance and continuation of the trend higher. In such a case we simply operate with support below price, in expectation of continuation of that trend upwards, seeking pullback opportunity until the trend stalls or reverses. The reality is that an S/R framework does NOT need an overhead resistance. You can operate quite happily with support below price and an uptrending market. When the trend finally stops at some point in the future, the market will generate new resistance, resulting in our more familiar S/R framework with levels above and below. The second way that price can arrive in "no man's land", as we've seen with today's NQ example, is through gaps at the open. Following a gap open,I will use standard opening range (OR) theory to define OR support or resistance. Typically this will be determined by the low and high of the trading timeframe opening candle. For demonstration purposes here, let's assume that I am using a 5-min chart. The opening 5-min bar will create some OR support and resistance as shown. For a large range candle I may consider this two separate levels. For normal size candles as shown here, I'll usually consider the whole area between these two lines to be one zone of S/R. If the market breaks above the OR it gives me a bullish bias, and I'm again in my scenario of support below price and no overhead resistance. Once again, this works fine. An S/R framework does not require overhead resistance. Our principles of future trend direction still apply. If the market breaks below the OR it gives me a bearish bias, and I now have the OR resistance above, and the gap closure support below, with an initial expectation of a gap-closing downtrend. Of course, the trends will not always continue nicely for a whole session. They'll stall and they'll reverse. So we need to keep updating our bias bar-by-bar as price action flows towards the session end. Looking at today's session, we see that price initially tried to move higher but collapsed back to the OR support after approx an hour, then breaking that support to move back down for the gap closure. So to summarise, analysis when price is in "no man's land" is no different to any other time. The framework will differ to it's usual state, as bullish price action will place price into a situation where we have support below but no resistance above. This is no problem. Expect the trend to continue… until it doesn't. In time, as we conduct our ongoing bar-by-bar analysis, a more typical framework will develop as the uptrend changes to a sideways or downtrending market, providing us with new overhead resistance at the point of reversal. When a market gaps open, you may wish to also look at the overnight session data to see if it has provided any significant S/R levels. Remember… the price does not actually gap. It moved to this new gap open level outside of the normal session hours. We can use overnight data to either (a) invalidate any S/R lines which may have been broken on several occasions, and/or (b) identify any new levels which were significant. 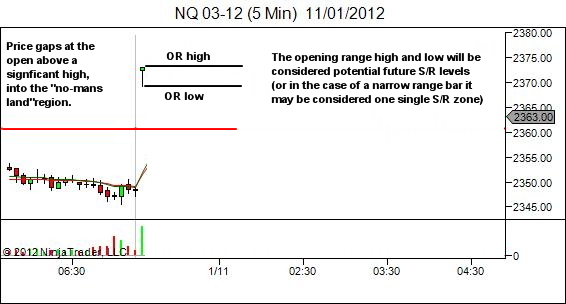 These overnight levels will have less significance than day-session levels, but it's still nice to be aware of them. You may wish to mark them using a different colour or a different thickness. Looking at the NQ overnight data, the data did not invalidate our previous support level (prior day's high) but in fact further validated it by holding at resistance before breaking. 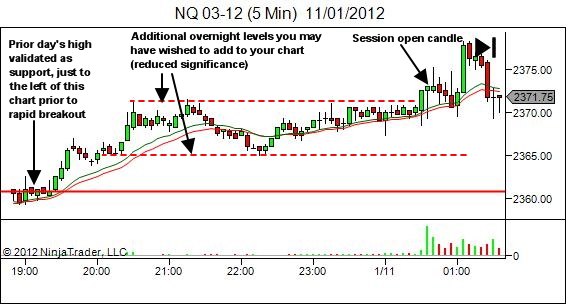 Overnight data also provided potential new levels as shown below. There is no right or wrong decision as to whether to use overnight data, or stick to the day-session data only. What is important though is consistency. Choose one method and stick to it. I personally do look at overnight data, but will generally only include the levels that are REALLY significant. That is, those that have trapped someone quite badly.